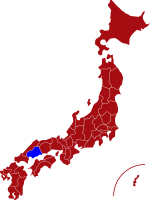 Hiroshima prefecture is situated in the southwestern part of Japan's main island Honshu. The prefecture is home to two UNESCO World Heritage Sites, one being the A-Bomb Dome in Hiroshima city, the other is Itsukushima in Miyajima. Miyajima, also referred to as the ‘Island of the Gods’ has retained its appearance since it was originally constructed over 800 years ago. It was officially recognised as a UNESCO World Heritage Site in 1996 and attracts millions of visitors every year. The shrine was designed and built on pier-like structures which creates the impression that it is floating on water when the tide is high. Visitors can walk up to the Torii Gate during low tide to take photos. 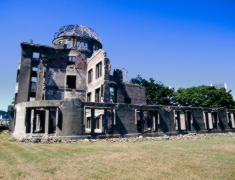 For more information about Hiroshima prefecture, see their official tourism website. Air - Hiroshima has its own airport and operates daily flights between Haneda and Narita airports in Tokyo, Sapporo, Sendai and Okinawa. Click here for its English website. Rail - The journey time from Tokyo to Hiroshima by Shinkansen is just under 4 hours. 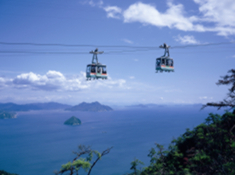 Miyajima Ropeway - taking the ropeway to the top of Mt. Misen is considered the best way to enjoy the spectacular panoramic views of Miyajima and appreciate why it’s regarded as one of the three most scenic views in Japan. The A-Bomb Dome is universally regarded as a symbol of peace and was officially declared a UNESCO World Heritage Site in 1996. The original building was designed by a Czech architect and was the only structure still remaining immediately after the first atomic bomb exploded in 1945. Hiroshima Castle - The original castle, also known as “Carp Castle”, was built in 1591, but completely destroyed on the 6th of August 1945. It was rebuilt in 1958 as a replica of the original castle and now houses the history museum of Hiroshima prior to 1945. 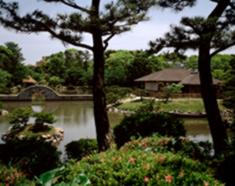 Shukkeien Garden is the oldest Japanese garden in Hiroshima city. 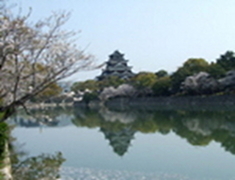 It was designated as a National Scenic Spot and is famous for its beautiful plum trees and cherry blossoms.